There's a gamut of books that fit the Thriller genre. Generally defined by pacing and mood, thrillers are jammed with action, pulse-pounding excitement and BIG concepts. Kathrine Roid's blog on Scribbling on the Computer has one of the most complete lists I've found. Add "Thriller" after each category: Action, Conspiracy, Crime, Disaster, Eco-, Forensic, legal, medical, Mystery, Political, Psychological, Religious, Romantic, Spy, Supernatural, and Techno. I would add International and Domestic. ITW listed War. Are there any missing? Note: ITW stands for International Thriller Writers. If you visit the ITW History page, you'll discover that fellow Rogue Gayle Lynds and Rogue friend David Morrell co-founded the organization. Suffice it to say, what began as a small gathering of thriller writers is now a membership organization with over 4,500 members in 49 countries. Studies have shown that each genre has its own readers, and gender biases when it comes to the writers. But times are a changing. There are more men writing in typically women-dominated genres, and vice versa. There's room for everybody―provided they can tell a good story. What kind of thriller novels do you love most and why? What was the last book you bought and by whom was it written? I started, and most of the Rogues have weighed-in. See their answers below. Notice a trend? Except for Gayle, the writers are all men. I'm happy to say, in the last two decades, a number of women have joined the ranks. All of the Rogues; former Rogues: Francine Mathews and Sonja Stone (YA); Stella Rimington; Leslie Silbert; Karen Cleveland; Zoe Sharp; Lea Carpenter; and Elisabeth Elo (whose first spy thriller will be out in March). Am I missing any? The last book I bought was The 100 Year-Old Man Who Climbed Out the Window and Disappeared by Swedish author, Jonas Jonasson. 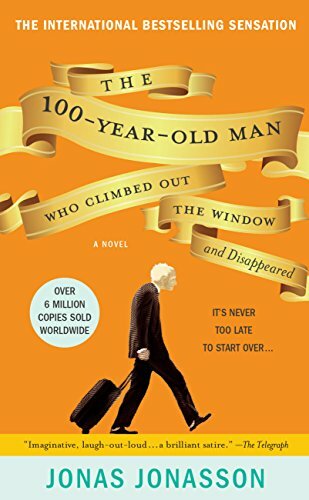 It's an hilarious story about a reluctant centenarian and explosives expert who runs away from his nursing home because he's healthy and he's not done yet! I bought it because my Swedish cousin recommended it. However, I'm the nerdy, stay-at-home Rogue, microwaving soup in front of the TV in my worn sweaters rather than racing atop the Great Wall in stilettos. My character stays put in her Cleveland forensics lab, and I read murder mysteries a little more often than globe-trotting spy stories. 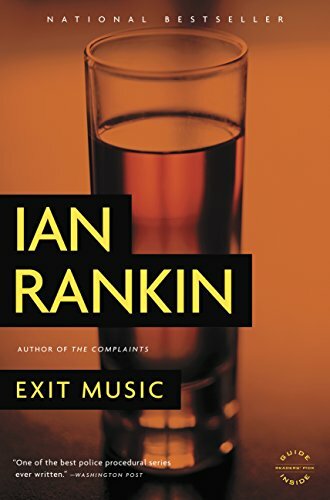 The last book I bought was Exit Music by Ian Rankin, the story of what's meant to be Detective Inspector Rebus' last case before retirement. But it's in Scotland and involves the death of a dissident poet with a suspect pool of visiting Russian businessmen, so, you know, there's that. I bought it to get Ian Rankin to sign it at Bouchercon, so I could tell him my story about how I hiked from the Edinburgh Marriott to the Oxford Bar, where he often writes, just to see the place, and how at 4 pm on a weekday there wasn't a soul in the place except the kindly bartender. CHRIS GOFF: I love it when books have tie-ins to places I've been. That's one thing that makes international thrillers so much fun to read. That and you can imagine yourself in places you've always wanted to go. GAYLE LYNDS: Thank you so much for the kind words and memories, Chris. It was a tumultuous time for thrillers when David and I decided to see whether any of our fellow writers in the field were interested in forming our own organization. That was back in 2004, and the response was an overwhelming "yes," and then the fun began. Have you ever tried to corral wild cats? Oh, my goodness. Still, so many stepped up that we soon had bylaws, a website, and a list of dreams which we achieved over the next couple of years -- a convention to celebrate all things thriller (ThrillerFest), and awards to recognize the best in the field. The first board members reflect the seriousness and excitement -- Tess Gerritsen, Lee Child, MJ Rose, David Dun, David Morrell, and me. 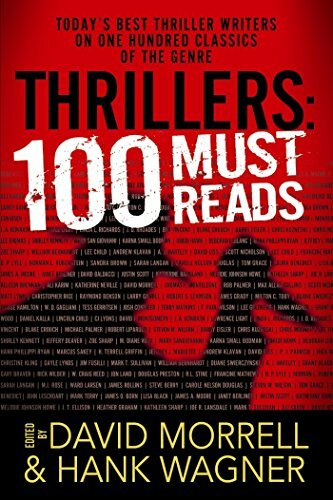 Like Chris, my first love of international thrillers started with the great Helen MacInnes, whom I profiled in Thrillers: 100 Must-Reads. But what I didn't realize until years later was, I'd also been reading a host of paperbacks that were under-the-radar in the field -- romantic international suspense (not respected, but a lot of it should have been) and male pulp fiction like Nick Carter and Mac Bolan. At the same time, I was reading the greats -- including John le Carre. What my omnivorous reading habits showed me was I loved that sense of global power, geopolitics both large and small, and secrets, adventure, and the great forces that can change and reveal character. I wanted fun, and I wanted insight. I wanted to write international thrillers! At the moment, I'm very much looking forward to Elisabeth Elo's debut thriller, coming out this spring. Can't wait for March when it's published! CHRIS GOFF: I'm excited for this debut also. ROBIN BURCELL: I read all over the board. I just love to read, and don't much care--as long as it is good. Hmmm... 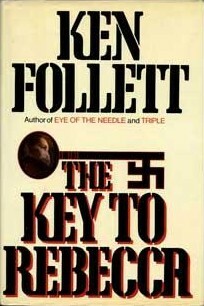 It was a long time ago, but I think I cut my thriller teeth on Ken Follett's Eye of the Needle and The Key to Rebecca. I think they were my first "big" books after Sherlock Holmes, Nancy Drew, etc. I remember being mesmerized with the stories. Mind you, I hadn't yet decided I was going to be a writer (I knew I wanted to write, just nothing on that scale. I was just out of high school. CHRIS GOFF: Robin, you and I have much in common (aside from poker). I loved The Key to Rebecca, and I've also always wanted to write a BIG International Thriller set in World War II. Think Herman Wouk! S. LEE MANNING: So many of the books I love have been listed - so I have to think to come up with something different. The most recent thriller that I bought was by our very own new Rogue August Thomas, Liar's Candle. It is a spy thriller, of course, and a good one. If I swivel my chair, I can eye all the books on my large bookcase behind me. It's an eclectic assortment - a number of which I've read, a number of which I hope to read soon, and includes novels by all the Rogues. There's also books by C.J. Box, Heather Graham, Lee Child, Daniel Silva. On and on. Like so many of us, I have the problem of too many books and too little time. Next to my desk are shelves filled with research books for my novel - next two novels to be honest - and I seem to spend most of my reading time on research and not enough time reading for enjoyment. So - what were my first thrillers? Chris, I love the idea of a big International thriller set in World War II, since Herman Wouk was one of my favorites growing up. I also loved Leon Uris, for action-adventure. I never read Key to Rebecca, but long ago, and far away, when I was first cutting my teeth on reading suspense, I read Rebecca by Daphne Du Maurier, which is described as a gothic novel - but seems like an early domestic thriller. I loved anything by Mary Stewart, who wrote wonderful stand alone novels like Madame, Will You Talk? or The Moon-Spinners. This has been a fun discussion. Now back to writing and research. CHRIS GOFF: I am amazed how many of us listed Helen MacInnes and yet most of us forgot Mary Stewart. I've read most of her books, too. K.J. HOWE: Chris, thanks for sharing the lovely memories. I'm honoured to be part of ITW. 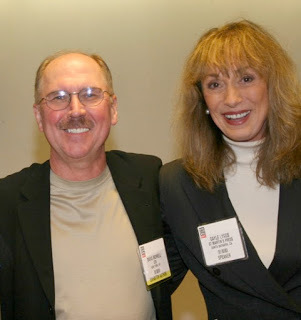 Both co-founders have profoundly changed my life--David Morrell via being my mentor, and Gayle Lynds for being a trailblazer for women writing kickbutt international thrillers. It's incredible to see how the organization has grown since its inception back in 2006. ThrillerFest has become a meeting place of some very special people, our thriller family. What kind of books do I love most? I adore international thrillers, as I enjoy traveling and experiencing new cultures, foods, people. 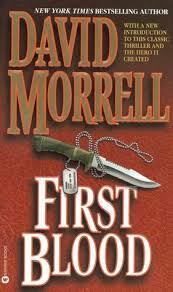 I recently reread David Morrell's FIRST BLOOD. I was astonished at how even though the novel is 50 years old! it reads like a modern-day thriller with crisp dialogue, tense prose, and a heart-wrenching story of a young soldier damaged by war. And it is unbelievable how David's character Rambo (named for an apple) has become ingrained in modern-day English as an adjective, verb, noun...becoming an iconic symbol. What books have I read recently and enjoyed? I can share two phenomenal reads, BELIEVE ME by JP Delaney and THE CHALK MAN by CJ Tudor. Both novels were brilliantly written, concise, with powerful characters. As an author, it's tough to turn off that editorial voice, but when it shuts off on its own, you know you're in the hands of masters. Why did I choose them? I decided to read BELIEVE ME because Marcel Berlins, the London Times reviewer selected it as his book-of-the-month, and he chose very well. Also loved the red-and-white checkered cover. I learned that the book had been an early work of Delaney's and he had re-written it with his honed writing skills. He knocked it out of the park. And I've heard nothing but good things about THE CHALK MAN so I needed to see what it was all about. I really loved the title, so evocative and intriguing. And I was very impressed by the characterization in this debut, so rare for a first book. Bravo to CJ for a blockbuster! CHRIS GOFF: I've just added your latest reads to my to-be-read pile, which is nearly ceiling high at this point. KARNA SMALL BODMAN: Chris, I love this idea of sharing our favorite thrillers. Mine have included "political thrillers" set in and around Washington, DC featuring threats, political wrangling and challenges to our country, whether stemming from inside or outside forces. 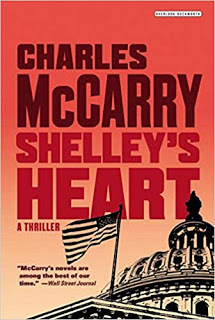 One of the best stories I ended up reading twice was written by former CIA operative, Charles McCarry (who has been a speaker at our International Thriller Writers conferences). It was Shelly's Heart, a great tale of Washington intrigue. When I began writing my own thrillers which, like Lisa's, do include a romantic twist in each story, I was influenced by so many writers I met and learned from at ITW -- including our own Gayle Lynds, Lee Child, David Morrell, John Lescroart as well as all-time bestselling author, Nelson DeMille and the late Vince Flynn whose character Mitch Rapp "lives on" through the pages of thrillers now written by a good friend, Kyle Mills. As for men vs. women thriller writers, I am now favoring many of our own Rogues and have been reading the latest contributions by K.J. Howe and Robin Burcell at the moment. I also find that women create terrific stories without a lot of graphic violence. Looking ahead, I plan to check out many more titles by the Rogues -- adding to the current pile on my night table. CHRIS GOFF: I like your point about women's stories. Do you think that's what men readers like most about books written by men? Graphic violence? I don't believe a book must have lots of violence to be thrilling read, but I do agree that international thrillers written by men tend to have more violence on the pages. The last book I bought was Daniel Silva's THE OTHER WOMAN. Forgot to put that up there. I haven't read it. Bought it for my better half. It'll go on my TBR pile after he's done. Also in my tbr pile. As I posted on FB, I may just take this next year off and just read. I read The Key to Rebecca before I read Rebecca as well! So Ken Follett turned you on to Daphne du Maurier. That's classic. I'm a fan of action/political thrillers due to the fact that they're true to life, plot twists, amazing action sequences and great characters. The last book I pre ordered was Dark Winter by A.J Tata. I bought because A.J Tata is a great author and The Real Book Spy recommended it. Just love that website. His books look like high-action tecno-thrillers. I have not read one of his books, but I'm going to go out and buy the first in the series. Thanks for sharing! Reading BEYOND THE PALE by Clare O'Donohue with two new protagonists she described as an "Irish Nick and Nora" in a race across Ireland. Wonderful! How did I miss this one? In my pile!